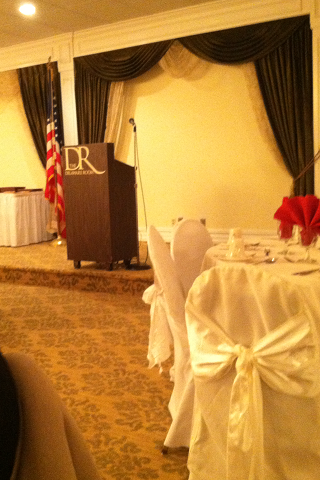 On Friday April 20th at The Delaware Room in East Stroudsburg, the 15th Annual Communication Studies Scholarship Award Ceremony was held. At this occasion the faculty, the majors, and their families together with some of our alumni, gathered to recognize the accomplishments and successes of their peers. During the Scholarship Awards Ceremony, the presentations of acknowledgments such as Academic Excellence, Roll of Distinction and Academic Recognitions certificates were awarded. There was also an induction ceremony for the Communication Honor Society of Lambda Pi Eta. The banquet took place during the award ceremony. Socializing and interactions with guests, faculty and alumni commenced afterward. PRSSA had several members recognized at the banquet this year. Taryn Maliniak received academic recognition for having a 3.4 GPA or above in the major. Avery Gardner was recognized as one of three best communications minors. Kathleen Johnstone and Lauren Anthony were recognized for being two of the top five juniors in the major. Stephen Natiello received an award for the Roll of Distinction. Lastly, Sean Ann Kelly received one of two scholarship awards for academic excellence. This event not only recognized the achievements of PRSSA students this year, but was also planned by the ESU chapter and its members. The banquet was a success and PRSSA was recognized and thanked for organizing such a special event for the department by the department chair Andrea McClanahan and the PRSSA faculty advisor Cem Zeytinoglu.